Butch Cornell was born on 21 november 1941 in Chattanooga, Tennessee. 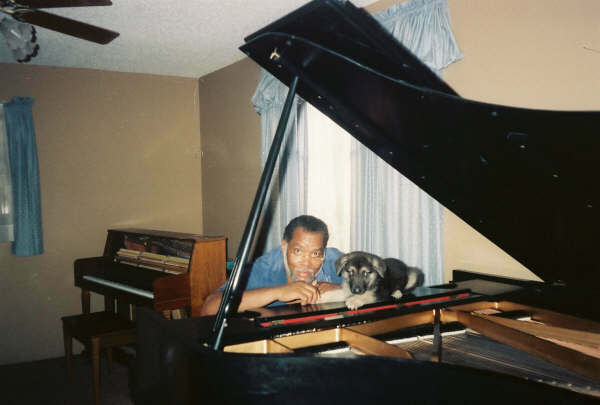 He began his musical career at the age of 10, studying classical piano at the Cadek Conservatory. He credits his aunt Rinaldo for his earliest musical experiences. At the age of 14, he began on piano with Charles Young (saxophone) and the Pace Setters Band (which also featured Joe Burke, drums; Joe Bennett or Joe Dossett, bass; and Jimmy Swan, vocalist) in and around the Chattanooga area. After graduating from Howard High School, Butch moved to Harrisburg, PA where he formed an organ (Hammond B3) trio, and worked several club dates and concerts on the east coast and in the mid-west. He recorded his first hit single, "Goosepimples" during this time. In 1970, Butch moved to New York City. While living there, he worked with many top-rated musicians and singers, i.e. : Freddie Hubbard, George Benson, Grover Washington, Jr., George Coleman, Grant Green, Woody Shaw, Arthur Prysock, Ron Carter, Billy Cobham, etc., performing in most of the United States, Europe, Japan and South America. He started his long association with Stanley Turrentine in september of 1970, and in the same year recorded the classic album "SUGAR" with Stanley for CTI Records. He also recorded his own hit composition "Sunshine Alley", for CTI Records. He was a part of Stanley's regular working group for 10 years. 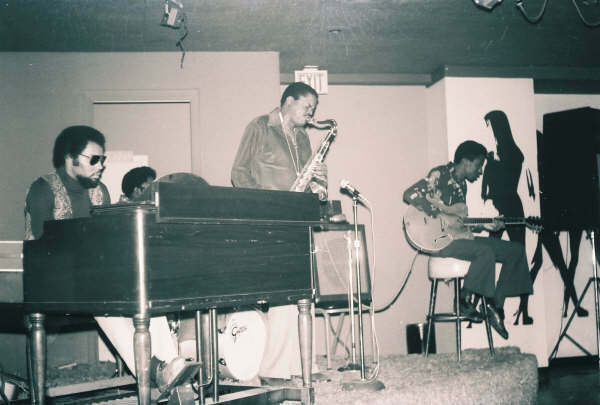 This group consisted of Roland Prince, guitar; Billy Kaye or Eddie Moore, drums; Butch Cornell, Hammond B3 organ and Stanley on tenor saxophone. In 1979, Butch moved to Los Angeles, California. There he worked with Plas "Pink Panther" Johnson, Calvin Keyes, Smoky Robinson's saxophonist, Fred Smith and his own trio and quartet. 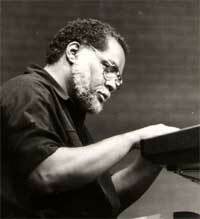 He again also worked part-time with Stanley Turrentine. Returning to Chattanooga in 1990, Butch Cornell formed a new group, "Butch Cornell & Friends", and starting playing jazz music in and around the city. He also performed with some of Chattanooga's greats; Ed Leamon, Brent King, Dexter Bell, Eddie Edwards. 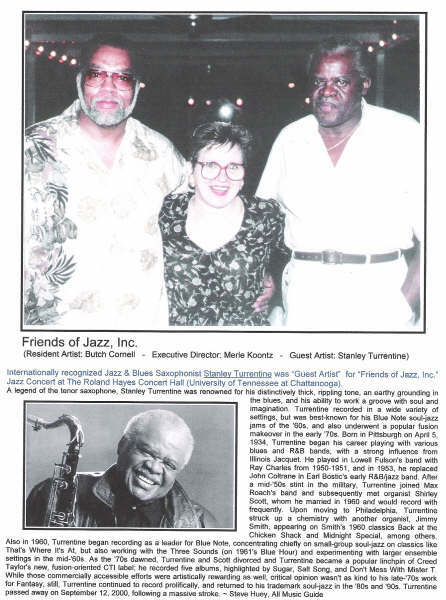 He also founded "Friends of Jazz, Inc" Jazz Society and produced many Jazz concerts at Miller Plaza, UTC Roland Hayes Concert Hall, The Blue Note Jazz Club, The Comedy Catch and Chattanooga's Southside Jazz Junction, owned by Dr. Barry and Becky Robertson. In 1999 Butch became ill with kidney failure (Dialysis) and stopped traveling and performing for a while. In 2008, Butch returned to the performing arena with a new sound. 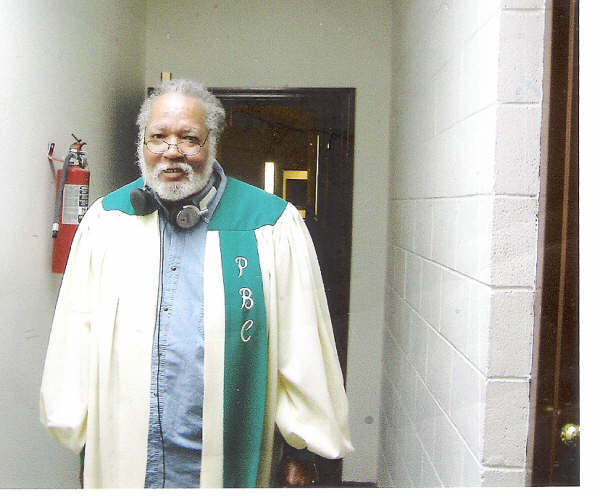 He also played organ for and was a member of Prospect Missionary Baptist Church in Chattanooga. Butch passed away on 07th december 2008 after a long period of illness. Click on the logo to see Butch's tour dates.